Make sure yours is crystal clear and perfectly purified every time your family takes a drink with a customizable and easily installed Ozone Pure Water Ozone Treatment System. Our inventory is stocked with the replacement filters, valves, switches, and injectors you need to keep your ozone water treatment system running at its optimum level. Find out just how ozone works to completely clean and disinfect your water system while leaving no residue or chemicals behind. Discover exactly what's lurking in your water supply, and which system would be most beneficial to your space. Take advantage of the opportunity for unlimited income while offering a quality, healthy service to your community. Ozone Pure Water has you covered for any of your water purification system needs including point-of-entry systems, point-of-use systems, and pool and spa treatments. Ozone Pure Water offers only high-quality equipment and parts, and can provide ozone treatment systems for all residential clients as well as commercial and industrial environments. Our free and advanced water testing services allow you to know precisely what’s hiding in your water. Our Ozone Pure Water professionals will walk you through the water treatment process, discussing each system, parts needed, and the cost to you. To schedule your complimentary water test and evaluation, call 1.800.633.8469 to speak with an Ozone Pure water expert. Ozonation is a new, innovative way to complete remove toxins, minerals, metals, and other contaminants from your water supply. Ozone water systems use ozone particles that act as an oxidant to help filter out elements from your water supply. Ozone Pure water Inc.’s multiple ozone water treatment solutions ensure there is a system that’s right for your home. From removing particular contaminants from your faucet’s water flow to sterilizing your entire water supply tank or well, our ozone water treatment systems can be customized to your exact needs. Find out which ozone water system is right for you by calling 1.800.633.8469 to speak with a water treatment advisor. How Ozone Water Treatment Works Learn the process of ozonation and how it treats your water more effectively than any other system. Chlorine Removal Find out how to remove the bad taste, smell, and color of chlorine in your water once and for all. Tannic Acid Get rid of the yellowish stains on your clothes, fixtures, etc that are caused by tannic acid in your water. Iron Removal and Whole House Water Treatments Discover your options for removing minerals like iron and sulfur from your home’s entire water supply. Water Softeners With these systems, there are no more hard water stains or calcium and lime buildup from your water. Pools and Spas These specially designed systems will rid your pool or spa water of bacteria, odors, and more. Under-the-Counter Ozone Water Systems Get cleaner, healthier water straight from your tap with a filtration system hooked directly to your faucet. Water Treatment Brochure Downloads Find out more about the ozonation process and its benefits with these comprehensive resources. Our systems come in all styles and sizes to ensure you get exactly what you’re looking for. For more than three decades, Ozone Pure Water Inc. has been a pioneer in the ozone water treatment industry as the oldest manufacturer of small ozone equipment. We provide reliable and effective water purification products in addition to excellent customer service. Ozone Pure Water Inc. can assist with whole house water purification systems including well water treatment, iron water treatment, sulfur water treatment, and hard water treatment. Our experts will evaluate your water purification needs and discuss which system is best for your home or office. Small Volume Ozonators With the ability to produce 100PPM-500PPM, this system will clean and disinfect your water while it’s still in the tank. Point Of Use (POU) Systems Treat your water directly at the faucet of your choice with an under-the-counter or countertop treatment system. Whole House Water Treatment System Remove contaminants like sulfur, iron, bacteria, and more from your entire water supply with a whole house system. Whole House Chlorine Taste & Odor Removal Rid home’s entire water supply of the taste, smell, and cloudiness that comes with chlorine with this removal system. At Ozone Pure Water, we take pride in offering our customers an extensive inventory, ready for immediate delivery. With hundreds of knowledgeable and reliable Ozone treatment dealers around the globe, you will find a home water system for your water filtration needs. To find the most efficient methods of ozone water treatment, Ozone Pure Water Inc. is constantly investing in research and development. 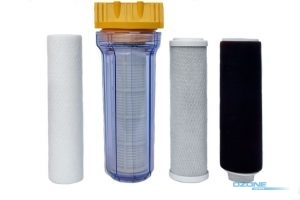 Cartridge Filters Your cartridge filter is important to removing oxides and colloidal particles from your water system. Granular Filter Media This filter type is good for clearing your water and removing particles like iron, sulfur, and more. Ultra-Filtration This filter runs water through multiple membranes to filter it completely. Car Filtration A filtration system that pushes water through carbon sheets to sterilize filter on the sub micron level. Ozonator Find out what size and type of ozonator will work best for your water treatment system. Air Dryers Reduce airborne odors and contaminants with an endless supply of ozone in your home. Gas Release Valves Sediment can build up in your system over time. These valves flush your system to keep it running smoothly. 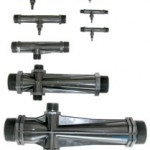 Gas Injectors Works directly in your tank to inject air and begin the ozonation process. Flow Switches Get just the right amount of ozone treatment for your water with a flow switch system. Filtration is a very important part of an ozone water treatment system when the removal of a particle is necessary. What Can Ozone Do For Air? It can eliminate odors caused by Smoke Damage, Animals, Animal Waste, Smokers, Mold, Mildew, Body Odors and more. You can use it in many applications including Hotels, Clinics, Kennels, Public Restrooms and more. 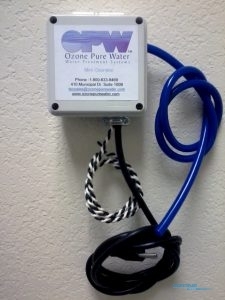 Ozone Pure Water filtering systems can provide you with cleaner and healthier drinking water. Our iron and sulfur removal from water systems can significantly reduce the buildup of iron and reduce hard water stains. These are just a few of the many benefits involved in high-quality water treatment equipment and applications. Updated on December 10, 2018 at 8:41 pm by Ozone Pure Water.